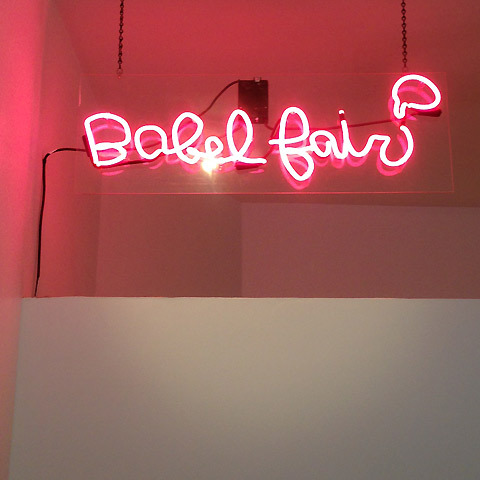 Babel Fair is a crossroads where the classic, conservative NoLiTa girl meets the edgy, unconventional jet-setter. This whimsical boutique provides a distinct assortment of up-and-coming globally sourced clothing and accessory designers, with a young and eccentric perspective. Erica Kiang, founder and avid traveler, has a soft spot for markets and bazaars abroad, which fuel her unique hand-picked findings for the boutique, and Babel Fair's Midtown Manhattan showroom representing select emerging designers. New merchandise arrives in the boutique weekly, featuring little-known international labels from places like Berlin, Australia, London, and Korea. Even the boutique's gift table does not fall short of Kiang’s worldly vision and fun style, with its interesting spread of utilitarian impulse items and small fashion accessories, such as Japanese cameras, Turkish tote bags, and a vibrant nail polish line inspired by international DJs. Customers receive a canvas Babel Fair shopping bag with purchase. If you ask them to giftwrap, they can add tissue paper to the canvas bags. Customers may also request paper gift bags lined with tissue paper, sealed with a Babel Fair sticker. City bike racks are located down Elizabeth Street near Price Street. Monday - Wednesday: 11:00 a.m. – 7:00 p.m.
Thursday - Sunday:	11:00 a.m. – 8:00 p.m.
A fine global assortment of hand-picked, clothing and accessories by international indie designers, with new inventory hitting the racks weekly. Sizes run from x-small to large.